A great pair of graphs – almost a lesson in visual communication on their own. What is the definition of extreme poverty? 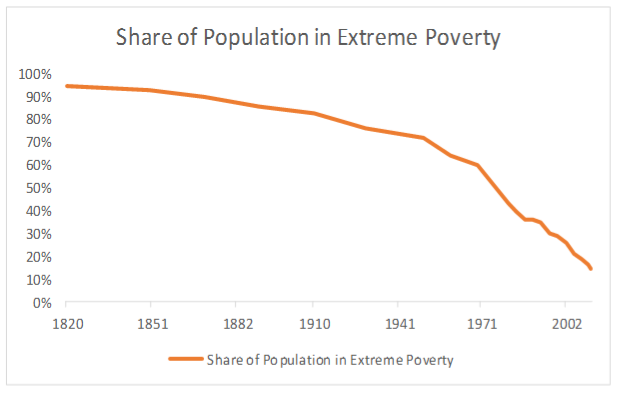 (a) It was in ~1970 when the number of people in extreme poverty actually started to decline in absolute terms. This is significant because until then all we had achieved was to slow it’s growth. It begs the question of why then and, with the exception of the early 1980’s, why since then? (b) How does the extreme poverty vary geographically and demographically? That would shine light on (a) and also help us focus on levers to best reduce it further. 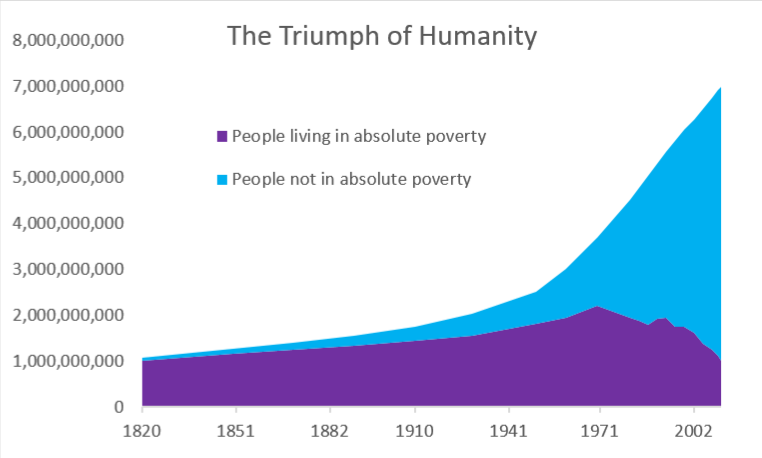 Explicit assumption: Fewer people in poverty is a good thing. Interesting, but it’s only a small fraction of what matters. The ethical picture is incomplete without also tracking: Political/civil liberties, average SWB set-point (partly genetic and possibly enhanceable), animal welfare standards and total animal use, total wild-animal brain mass, and overall system stability. Given the dismal state of political and civil illiberty, and ignoring externalities, I’d prefer people under at least $20 per day to not exist. At least pre hedonic enhancement. For now, welfare and charity should be coupled with anti-baby incentives.